There are a series of plays devoted to the song performances in puppet plays and kabuki based on a Genroku period (1688_1703) love story of the bathhouse girl Kosan and the Osaka actor Kaneya Kingorō, who died in 1700. The first puppet play appeared in ca. 1702 or 1703. The first kabuki productions didn't appear until 1780. In Japanese Life, Love, and Legend: A Visit to the Empire of the "Rising Sun by William Conn in 1886 gave one, i.e., the version he knew, of the love story of Kingorō and Kosan. In his telling Kingorō is in love with his adopted sister, Kosan. Kingorō's mother died giving birth to him, so his father was happy to bless this union. However, there is also the possibility of Kingorō marrying into a wealthy family. For this reason there is plot to get the young man out of the way long enough to marry off the young and delicate Kosan to someone else. She isn't even 15 years old yet. Kingorō is sent off in service of the local daimyo. While he is gone insecurity and jealousy eats at Kosan. Despite her father's attempt to get her to give up on a future marriage to her adopted brother, she sets off barefoot and penniless to find her fiancé. She walks without rest toward the capital city of Edo. On the second night she is attacked by brigands who carry her off with them. Kingorō hears of her search for him and so he returns home to Kamakura where his father tells him that Kosan had drowned herself. After months of grieving Kingorō agrees to marry someone else. Eventually Kosan escapes from her captors. Unable to return home she finally gets to Edo where she becomes a popular geisha. One evening she is performing at a 'house of ill fame' when Kingorō comes in with some of his friends. He recognizes her immediately. He thinks he has been betrayed by this now fallen woman. She weeps bitterly, but then accuses him of having been the real betrayer. Her words win him over and he regrets his accusations. He takes her home with him and becomes his mistress and in time gives birth to a son. One day while Kingorō is out an old man comes to see him. Kosan offers him the greatest hospitality. When he see the boy he begins to cry - with joy, we assume - and tells Kosan that his is Kingorō's grandfather. The old man has come to take back to his disgraced father and the wife he abandoned. This is all news to Kosan who didn't know that Kingorō had actually married someone else. She resolves to kill herself and writes a letter to her lover. She takes her son to her sister and asks her to look after him. Then she returns home and stabs herself in the neck "...murmuring the names of her son and her lover." Kingorō returns home and finds Kosan dying in a pool of blood. She is too weak to talk, but points to the letter. It tells him to return to his family and to forget about their love. He throws himself distraught on her body. 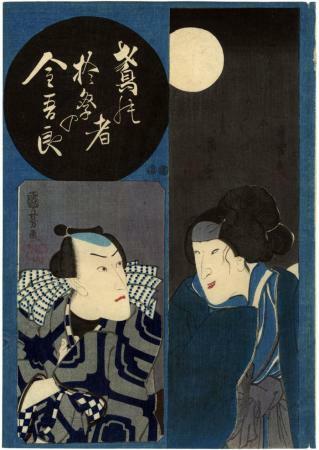 This print commemorates the play Chikai Musubi Ukina no Tategaku (盟結艶立額) at the Nakamura Theater in Edo in 1850.